Ray Briant is a third generation full time career fire fighter. 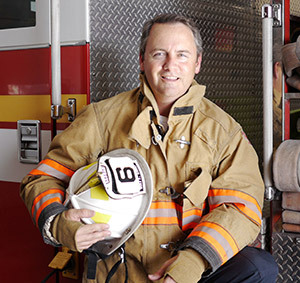 The South Florida Battalion Chief works for one of the more busy fire departments in the state. Briant,works 24 hours on and 48 hours off. In his spare time he’s turned to his entrepreneurial ideas. “I’ve had a lot of great ideas for businesses, apps, and online platforms. I’ve even had some ideas for inventions” Briant told Techfaster in an interview. “but the idea for TiloTag was special, so I went forward with it”. On Briant’s off days he’s a web developer and small business web consultant helping entrepreneurs and small businesses build and craft their online presence. But this time it was his turn to use his skills, ideas, and his oldest son as an inspiration for an app that can be used for a variety of things from education, to tours, small business proximity based advertising, family chronicling and even scrapbooking. In a nutshell TiloTag let’s you put messages in their place, as in it preserves them where they were actually left. The app idea came about from Briant’s son’s love of history. They talked amongst themselves about how great it would have been if George Washington, Abraham Lincoln or even Dr. Martin Luther King were able to leave an audio, video or text based message for people that came after them. With that idea, Briant went on a spree looking for ways to make this app come to reality. That’s why this firefighter turned to the community of crowdfunding backers. There’s nothing out there like TiloTag, but if you hear Briant speak about it you start to quickly see the value across a number of uses. Earlier we talked about the educational uses of Tilotag here. Check out this video about using TiloTag for digital scrap booking. You can back TiloTag on Kickstarter here.